Chhattisgarh is well known for its temples and waterfalls. Breating view of nature and tribal life brings Chhattisgarh most popular destination in India. 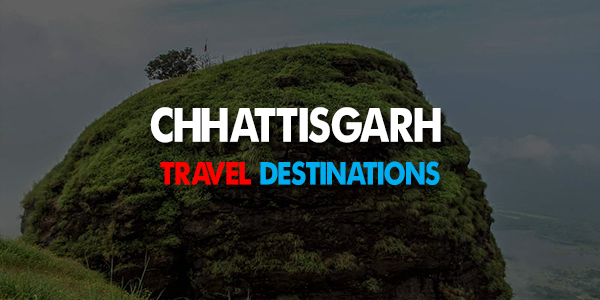 Read this article and learn more about best travel destinations in Chhattisgarh. Chhattisgarh is a state in nascent stages and has a very impressively thriving tourist industry. The state separated from Madhya Pradesh and hence, is as bountiful and beautiful as MP. There are dozens of tourist spots with lovely scenic splendour, waterfalls, temples, wildlife spotting, mining, shopping, forests, and zoos. For all the travelling lovers, we have brought the list of some of the must travel places in Chhattisgarh state. Raipur is the state capital and is famous for the parks, shopping and temples. Shahid Veer Narayan Singh International Cricket Stadium has gathered many admirers and high ratings from the tourists visiting the place; it is located in Raipur. Other places are Shri Rajiv Lochan Mandir, Urja Park, Shadani Durbar, Nay Raipur Central Park, Gandhi Udyan, Ghatarani Waterfalls, Nandan Van Nature Center, Vivekananda Sarovar, Mahakoshal Art Gallery, Udanti Sanctuary and lots more. Jagldalpur is full of the historic monuments and is famous for the caves, waterfalls, temples and shopping. The must visit places in Jagdalpur are Kailash and Kotumsar Cave, Chitarkot Waterfall, Kanger Valley National Park, Anthropological Museum, Danteshwari Temple, Chitradhara Falls, Ganga Munda Lake, Mandawa Falls, and Dalpat Sagar Lake. There is another Zonal Anthropological Museum which is a must visit place while visiting Jagdalpur. Durg is a place which is full of temples which are a must visit. The most prominent places to be visited in Durg are Tandula Dam, Maitri Bagh, Pasharwanath Tirth, Chandi Mandir, Shiv mandir, Siyadevi and Ganga Maiya Temple, Karkabhat (this place ages to the Megalithic Age), and Kukurdev Temple. Maitri bagh was established through the joint efforts of India and Russia and hence has been named on friendship as Maitri Bagh. Bilaspur is rich in wildlife and hence has the national park, zoos, shopping and temples. The must visit places in Bilaspur are Achanakmar Wildlife Sanctuary, Kanan Pendari Zoo Park, Rama Magneto, Kutaghat Dam, Bubble Island, Deorani Jethani Temple, Kori Dam, Shitla Mandir, Didneswari Temple, and Madku Dweep. Bhilai and Korba are famous for the temples and shopping. In Korba there is Chakreshwar Mahadev Temple and Bango Dam which are worth visit. In Bhilai, you can visit Nehru Art Gallery, Arjuna's Rath, Jayanti Stadium, Jagannath Mandir, and Pioneer's Monument. Jashpuri is a tourist destination which is famous for Rajpuri Waterfall, Rani Dah Waterfall, Kailash Caves, Rani Jhoola, Danapuri Waterfall, Bane Waterfall, Hara Deepa, Khuriarani Cave, Gullu Waterfall, Bhringraj Waterfall, Bel Mahadev, and local markets for regional shopping. While you are in Koderma, you can visit the Tomb of Sant Paramhans Baba, Koderma Reserve Forest, Sonbhandar Caves, Maa Chanchala Devi Shaktipeeth, Makamaro Hills, Tilaiya Dam, Satagawan Petro Falls, Dhwajadhari Hills, Dhwajadhari Pahar and lots of other places. Sirpur is famous for the temples, excavations, historical places, music and festivals which are regional. You can visit Surang Tila Temple, Gandheshwara Temple, Anand Prabhu Vihara, and Laxman temple. Around 15 years ago, the excavations were first made and the tourists began shoing interest in this quaint little town. Also, the Buddha Vihara in Sirpur is around 4 times larger than the ones in the Nalanda University in Bihar. Kawardha is famous for the fisheries, palaces, historical places, temples and mining. The places of interest in Kawardha are the Palace of Kawardha, Bhoramdeo Temple, and Bhoramdeo Jungle Retreat. Champaran can be explored via the Jiwdhara market, Kotwa Bazaar, Chaman Bazaar, Meena bazaar and various other temples which are scattered in the region. Now let us compile the tourists spots based on the interests or type of the activities which can be done in various regions of the state. Chitrakot Waterfalls is one of the best tourist places in Chhattisgarh. It is often called “The Niagara Falls of India”. Don't miss Chitrakot Waterfalls if you are planning to make a visit to Chhattisgarh.